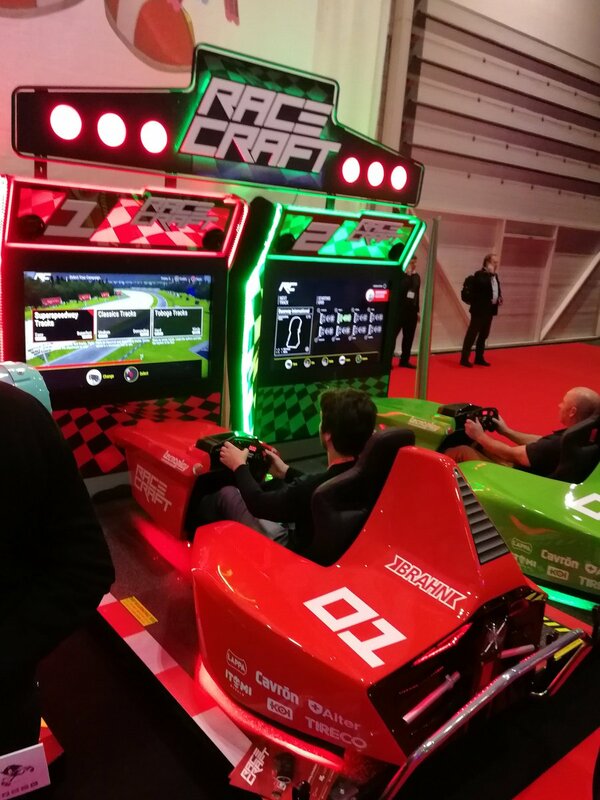 While the IAAPA trade show tends to soak up most of the arcade news that’s out there, it is not the only amusement/arcade related event of it’s kind to find out there. Every January is a show in London, UK, know for the past while as EAG. EAG 2018 opened this week and thanks to readers on Twitter, we have a look at what was there. As a note, since IAAPA tends to be the show that major manufacturers launch new product, there are many titles that will have been revealed but EAG tends to be the first time that these games show up on European shores. BTW – I’m not sure what happened with WordPress but it used to be that you could embed single tweets into posts just fine but now they don’t show up correctly. I’ve been trying to find a plug-in to fix that but so far no luck. Just posted to YouTube by Pinball News, here’s a tour of the show if you have the time. There are a lot of slot machines and similar games found there as laws and the market for those kinds of games is a bit different than what you tend to see in the US at large. Toby came across a Chinese company called Funshare with a motion simulator with a game called 3D Extreme Flight 2. He mentioned the Galaxy Force cabinet inspiration although the game was not working when he came across it. 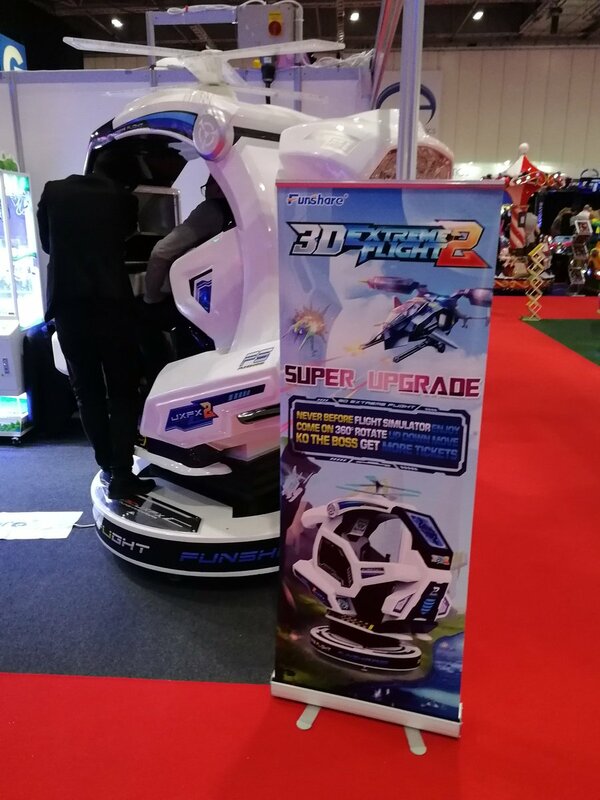 I found this picture of the cabinet on Facebook but not anything about the game software; 3D Extreme Flight (the first one) seems to be classified as a kiddie ride. This game was certainly the most popular title I covered during IAAPA 2017 and it is made an equally large splash at the Bandai Namco Europe booth. It appears to be the same cabinet as seen at IAAPA but am unsure whether or not the software is the same. From what a local distributor is telling me, these will ship in the US next month so if you’ve been chomping at the bit to see this one, your chance will come soon. Via Toby. 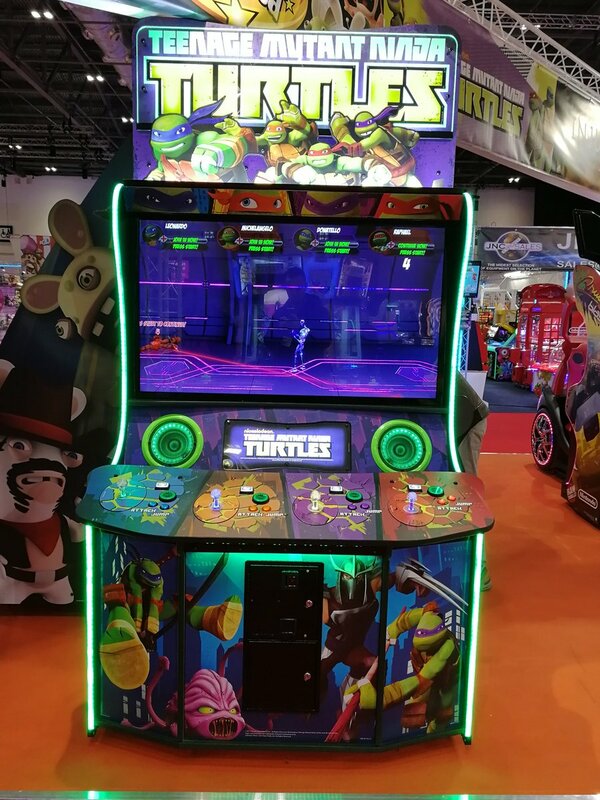 Speaking of Bandai Namco, the reason that TMNT is at their booth is that Bandai Namco Amusements Europe is the official distributor for companies like Raw Thrills and Adrenaline Amusements in the European market. Thus they also had Injustice, X Games Snowboarder, Rabbids Hollywood (seen in the tweet below) and some other titles there to check out. If you are a pinball wizard and wanted to get your fix of Stern’s latest content, then Electrocoin was also the place to go. I believe this was the first event that GotG was shown in Europe. This was at IAAPA and I captured a little video of it but here’s something the company made touting their EAG presence. Sega was there and had a similar booth to what was setup at IAAPA. This marked the first time that the upright Operation GHOST would be showcased in Europe like this. That is all I’ve managed to gather for now. If there was something else there that is new for the arcade business that was missed, let us know! Race craft looks interesting to play if I come across it. Iam curious about the height of TMNT though. I know it’s especially catered for kids but I hope the panel isn’t too low down that I have to crouch on my knees as a lot of the games these days that you just press a button or joystick you have to sit down on your knees to play the game such as Crossy road. I think games like this should have seating so everyone can play properly. I’m very surprised sega didn’t use this opportunity to show the new house of the dead game when it’s due out later this year. I know it’s unclear how far completed the game is but I thought they would show the game at the show even if it’s incomplete like when they showed sega’s lets go island with just the screen and half the cabinet. The TMNT cabinet looks exactly the same as the IAAPA build and I had no issues with the height of the CP (I’m about 1.6 meters tall). While I am not sure of the exact height from the floor, if it is lower than normal then it isn’t much. Looks like Sega will be pulling the guns out for JAEPO at least, it’s just often up in the air as to what will go West. Either way, shaping up to be an exciting year!